Idaho® Potatoes are delicious and nutritious! 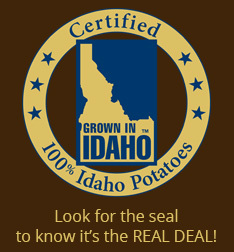 Idaho® Potatoes are fat-free, cholesterol-free and a good source of Vitamin B6 and dietary fiber. They are also high in Potassium and Vitamin C.
Idaho® potatoes are loaded with important vitamins and nutrients that help keep your body fueled and strong all day long. Potatoes are an excellent source of vitamin C, with one potato providing 30 percent (27 mg) of your daily recommendation. This water-soluble vitamin acts as an antioxidant and can stabilize free radicals to help prevent damage to cells. Vitamin C also aids in collagen production, a process that helps maintain healthy gums and is important in healing wounds. Vitamin C boosts iron absorption and may help support the body's immune system (Gropper 2008). Data from the Continuing Survey of Food Intakes by Individuals indicates that potatoes rank in the top five of dietary sources of vitamin C for Americans (Cotton et al. 2004). 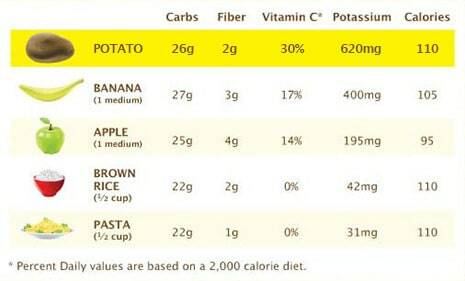 Potatoes are among the top sources of potassium. In fact, potatoes have more potassium per serving than any other vegetable or fruit, including bananas, oranges, or mushrooms. Research suggests that diets rich in potassium and low in sodium may reduce the risk of hypertension and stroke and help lower blood pressure (Dietary Guidelines Advisory Committee, 2010). Potatoes are a good source of vitamin B6, a water soluble vitamin that plays important roles in carbohydrate and protein metabolism. It helps the body make amino acids that the body uses to manufacture various proteins. One medium potato with the skin provides 2 grams of fiber, which is 7 percent of the daily recommendation. Dietary fiber, a complex carbohydrate, is the part of the plant that cannot be fully digested and absorbed in the bloodstream. 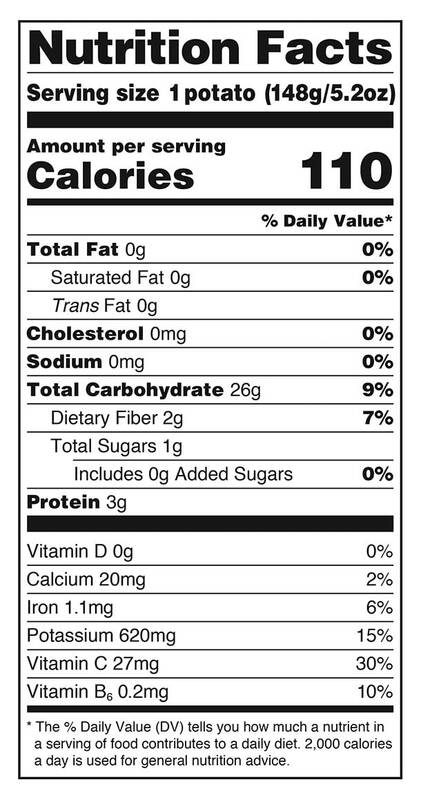 Dietary fiber has been shown to have numerous health benefits, including improving lowering the risk of heart disease, diabetes, and obesity, and increasing feelings of fullness, which may help with weight management (Dietary Guidelines for Americans, 2010). Carbohydrates are a major source of energy for the body. There are two types: simple and complex. Simple carbohydrates are found in many types of foods, from sweets to fruits and vegetables to milk. Complex carbohydrates may be referred to as starches. Grains and grain products, beans, and some vegetables and fruits provide complex carbohydrates. Potatoes contain both carbohydrate types.